OTTAWA - The Conservative government has appointed three new police members to its firearms advisory panel, including two that government MPs like to cite as anti-registry gun advocates. However, a closer look at the parliamentary testimony of Bob Rich, chief constable of the Abbotsford Police Department, and Calgary police Chief Rick Hanson reveals some sentiments that could rattle the current pro-gun committee. And that has one of the three departing panel members spitting mad. 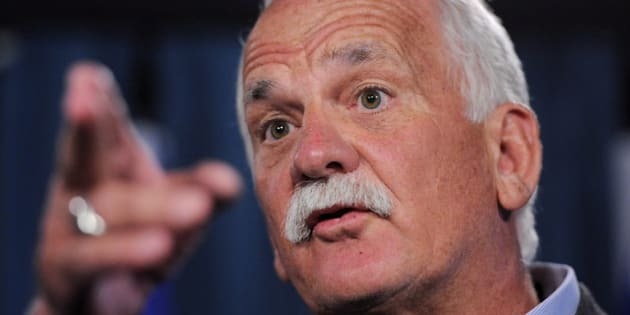 Gerry Gamble, past president of the Sporting Clubs of Niagara, says he's personally offended by "the unprofessional way" he was dropped from the 12-member panel that advises Public Safety Minister Vic Toews. "I've spent 20 years of my life on this issue, I've spent 20 years of my life supporting the Reform then the Alliance then the Conservative party — because they were the only party that seemed remotely interested in the rights of firearm owners," Gamble said in an interview. "Now, this is my reward — a terse, pretty impersonal letter that says, 'We don't need you anymore.'" His replacements, said Gamble, "are not friends of gun owners." Prime Minister Stephen Harper very publicly rejected the panel's firearms recommendations last December when it was revealed they included reclassifying some restricted weapons to make them easier to obtain, and extending firearms licence renewals to 10 years from five. "I'm obviously very concerned with some of the recommendations made in that report, and I think the committee does need some re-examination in that light," Harper told the House of Commons at the time. Three new panellists — Hanson, Rich and Mike Sutherland, president of the Winnipeg police union — were announced last Friday. Hanson and Rich have been cited frequently in Conservative MP statements about the registry since they testified at committee that the long-gun registry was of limited value — a contradiction of the official position of major police groups. But government MPs never highlight other parts of their testimony. "I take the view that we have taken the wrong approach to handguns," Rich told a Commons committee in May 2010. "I do not believe any person should have that gun who is not essentially required to use such a device in their profession to protect the public. I believe it should be prohibited in all cases." Rich also testified that "assault rifles should never be in the hands of any private person. There's just no reason for that." Hanson, meanwhile, testified that it was the gun registry's criminal sanctions that he opposed, not registration itself. "We're not against a registry that is properly administered and that decriminalizes the possession of sporting weapons," he said at the time. He also made a prescient comment, given that Quebec is now maintaining and developing its own gun registry while the national database has been destroyed. Hanson testified that "registration can be more than adequately addressed through provincial registries that recognize regional differences and that decriminalize something that ought not to be (criminal)." Julie Carmichael, a spokeswoman in Toews' office, would not characterize the changed composition of the firearms advisory panel, other than to say "we have strengthened the membership." "We look forward to hearing the advice of the committee to further strengthen our firearms laws through common sense reforms," Carmichael said in an email. Gamble said he believes the Conservatives are making a political error by giving the cold shoulder to some of the panel's most ardent pro-gun advocates. "I think these appointments have been done purely for public relations purposes," he said. "Let's face it ... this is not going to change anybody's mind." Gamble said that while tinkering with the composition of the panel won't cause gun control advocates to embrace the Conservatives, the government's actions may just convince some gun owners to stay home next election. "To be honest, if often strikes me that they're just doing enough to keep gun owners onside without rattling anybody's cage," he said. "I know many people, what they've done is they've got so fed up with this that they simply don't vote." Indeed, Wendy Cukier of the Coalition for Gun Control — no friend of Gamble's — sounded much the same note from the opposite side of the gun debate chasm. The committee is still heavily dominated by gun advocates and industry players, she noted, adding that the new "hand-picked" police appointees undermined the broader police message during the registry debate in Parliament. "I don't think it signals anything for the direction of the committee," Cukier said in an interview. "I think it signals that the government was sensitive to the criticism that police had been essentially dropped from the committee."